I have finally found an eye cream that works! Yay! My eyes are super sensitive so it has taken me years to find something that doesn’t irritate them – it’s kind of a breakthrough. This pot of gold, or should I say venom, comes from one of my favourite skincare brands Rodial. 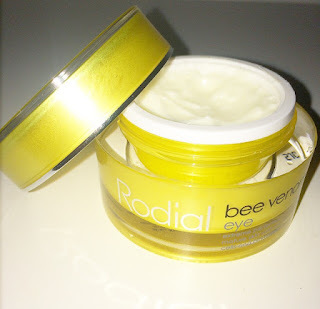 When the Rodial Bee Venom Eye Cream was launched a few years ago and there was quite a lot of buzz around it as all the celebrities were going crazy for it. There is such a thing called a Bee Venom facial which is what inspired these products, however, the Rodial Bee Venom range is more of a play on words, than ingredients. The percentage of Bee Venom is extremely small, the last ingredient on the label, so I can assure you that no Bees were harmed in the process of making these products. They are completely ethical. Now that I have hit my mid 30’s I have noticed that my eye area is starting to age first. I don’t have wrinkles, only a few faint lines, and a little pigmentation which is minor. I actually find this whole ageing process weird, because, you think you’re doing all of the right things to look after yourself, but then, suddenly you look in the mirror and think OMG, you’ve suddenly aged. Its scary. However, I do believe that if you start using preventative skincare early on, you will definitely delay the ageing process. I have recently been stressed and changed my job so have been getting up super early to get to work. I have been beyond tired and you can see it on my face. 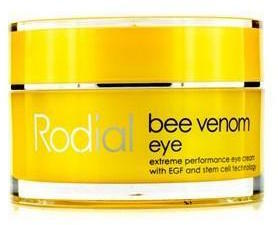 I started using the Rodial Bee Venom Eye and it has made a huge difference to my skin. It uses stem cell technology and melittin peptide to smooth your under eye, brighten dark circles and firm the skin. The Bee Venom stimulates blood circulation to plump the skin and works in synergy with plant stem cells, haloxyl and cycloppeptides-5 to even out skin, smooth lines, and improves elasticity. If that was too many scientific words, I can tell you the simpler version – it works! I know the price of this eye cream is enough to sting you, its expensive, but the pot is the size of a face cream so it will last you well over a year. The consistency is creamy, smells incredible and absorbs easily into the eye area. It does sometimes feel too rich under my eye makeup and does make my mascara smudge, but that could be because its summer. I would use less, a rice grain amount or use it at night.